Veterinary technician and 2016 finalist, Shanda Drawdy. 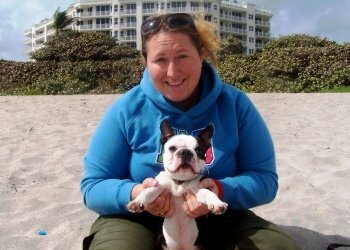 Meet Shanda Drawdy, a Certified Veterinary Technician and Team Leader at Harmony Animal Hospital in Jupiter, Florida, where she has worked since 2003. She graduated with a degree in English literature and even continued on to graduate school, but she couldn’t ignore the pull of veterinary medicine. She keeps her clinic skills sharp by managing her own lively menagerie, which includes, by her own declaration, “the World’s Cutest Boston Terrier,” Bowie; two cats, Fergus and Danzig; two rowdy American bulldogs, Fauna and Lemmy; and an American pit bull terrier named Hazelnut. Her leisure time mostly revolves around animals: she enjoys hiking, as well as training and sometimes competing with her dogs in skills such as Nose Work, Barn Hunt, Agility, Obedience, Rally, Weight Pulling, Dock Diving, and French Ring Sport. When she’s not out adventuring with her dogs, she’s either buried in a book, snuggling with her pets and watching movies (she loves foreign films—the verdict is still out on the pets’ preferences), or spending time with her friends. I grew up surrounded by dogs, chickens, and cows and was always involved in their care. As a small child, going to see our family veterinarian was better than Disneyworld as far as I was concerned. Supremely patient with curious children, our vet always showed me everything he was doing with our dogs; I got to use his stethoscope and look through the microscope. His early encouragement was a big part of the foundation that led me to continue working with dogs and horses as a teenager, eventually leading me to my first job in an animal hospital at the age of 18. I tried really hard not to be a vet tech. Growing up around dogs and horses, I somewhat naturally fell into kennel work as a teen. A veterinarian saw potential in me; I started training as a technician at his behest. But I always said, “This is temporary” and convinced myself it was just to pay for college. Everyone I knew just nodded, smiled, and went along with my ridiculous protestations—all while winking at each other as I toted home yet another broken animal in need of extra care. I went to university (English literature!) and even started graduate school, all while supporting myself by nursing animals. Denial is a powerful thing. I rushed home, withdrew from grad school, and immediately started working towards my certification. Now I plan to pursue a specialty to push my career further. My path has been a convoluted one, but it’s been right for me. (Dear little uromastyx, thank you. I would love to see more public understanding of, and thereby increased appreciation for, the role each position plays in veterinary medicine. The average pet owner does not have a solid grasp of the level of [the] organization, education, and commitment that goes into a typical day in a hospital. We put our blood, sweat, and tears into the partnerships we build with owners to keep their animals happy and healthy; being better advocates for our profession will ultimately benefit us all. Do you see the value of pet insurance for your clients? Does your clinic/hospital talk to patients about pet insurance? I’m a huge advocate of pet insurance! I recommend it to all my friends and family. I’ve repeatedly seen it help owners in critical situations by eliminating finances as an additional source of stress during an already difficult moment. As a hospital, we make pet insurance highly visible in the practice via educational materials. We also make sure all new patients get information about pet insurance and why we think it’s something that should be part of their animal’s healthcare. We invite you to stay tuned to our blog, where we will share in-depth Q&A sessions we held with the remaining finalists. (You can learn more about the Why I Love Being a Vet Tech Contest here.) The contest winner will receive a one-year NAVTA membership and a paid trip to the 2017 North American Veterinary Community Conference. You may vote here for Shanda or any of the other finalists once a day through Thursday, October 6th.